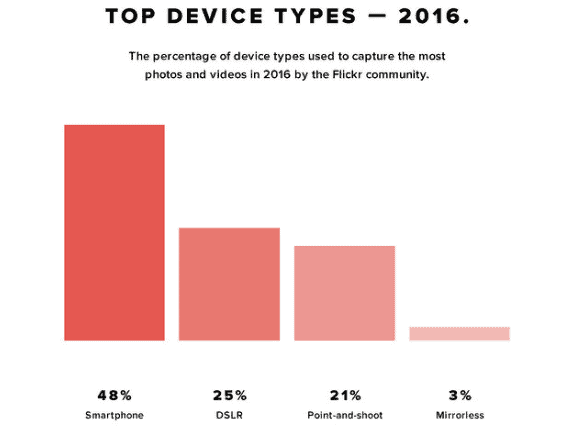 Apple remains the leading camera brand among its users according to a report by Flickr. Smartphones have grown as the device of choice for photography enthusiasts, while point and shoot and DSLR cameras are restricted to professionals. Apple has become the leading camera brand among its users, filling eight slots of its top ten most popular cameras. iPhones now account for 47 percent of its photographers, compared to 24 percent using Canon cameras and 18 percent using Nikons. In 2016, we saw interesting trends continue with the top manufacturers and devices. As in previous years, smartphones have grown as the dominant device of choice, while point and shoot and DSLR cameras both lost ground. Smartphones accounted for 48 percent of the photos uploaded to Flickr, up from 39 percent last year. DSLR was 25 percent, down from 31 percent in 2015, and point and shoot was 21 percent, down from 25 percent in 2015. Mirrorless remained flat at 3 percent of photos uploaded in 2016. 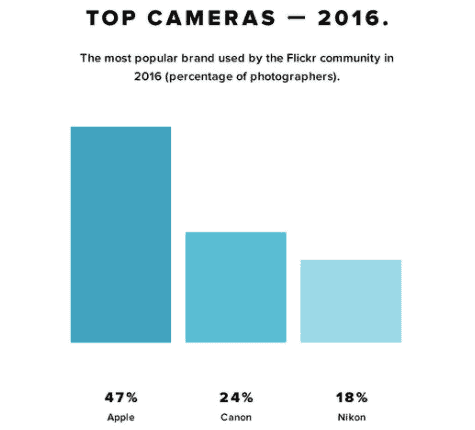 Canon was the second largest brand used by the Flickr community, with 24 percent of users choosing the manufacturer. The Canon 5D Mark III and 5D Mark II were the only non-Apple cameras to break into the top-10. Nikon remained in the third position with 18 percent of Flickr users. The new iPhone 7 launched this year has nothing new in terms of design, screen size and resolution and its major specs are close to the iPhone 6s Plus. However, a lot of innovation has happened in the camera department. Next to the standard 28mm equivalent lens there is a second 56mm module to enable optical zooming. Combined with digital zoom, you can drag the zoom slider in the camera app up to a 10x magnification. Apple has capitalized on these new features to bring dual camera imaging to its best with iPhone 7 Plus. Apple’s Portrait mode online, featuring the work of several photographers has redefined smartphone photography. As for brands, Apple continued its dominance. 47 percent of all Flickr users used an Apple device to upload images to the platform. In fact, 8 of the top 10 devices were iPhones, with the 6, 5s, and 6s in the top three positions.